Acting is the most important aspect of a film to me. It’s the first part of the entire pie that I notice, it has the most effect on my enjoyment of the story, and it can make or break a movie once I put on my critic’s hat. B-movies sometimes get a pass, other aspects of a film can blow away everything else, there are, of course, exceptions, but acting plays the biggest role when I sit down to review a film, and the acting in V for Vendetta, at least by the lead character, was so distractingly terrible that any strong/impressive/fascinating facets were pushed to the side. Don’t get me wrong, I like Natalie Portman, I loved her in Black Swan, I think she’s deserving of an Oscar for Jackie, I just also can’t believe how badly she played the protagonist in V and how little she added to what otherwise could have been a fine, dystopic, graphic novel-style flick, that for some reason still gets extremely high overall ratings, despite its one major flaw. In the near future, Britain will isolate itself off from the rest of the world. After a war, the collapse of the United States, and a rampant virus, the borders are closed, refugees and those of other religions are sent off, homosexuals are considered abhorrent, differences of every kind are prohibited, and a totalitarian government rises to power in order to “keep England safe.” It works, the crisis blows by, but at what cost, and will individual rights ever be given back to the people? One man makes it his life’s work to make sure that they are, and he won’t be promoting peaceful protest. 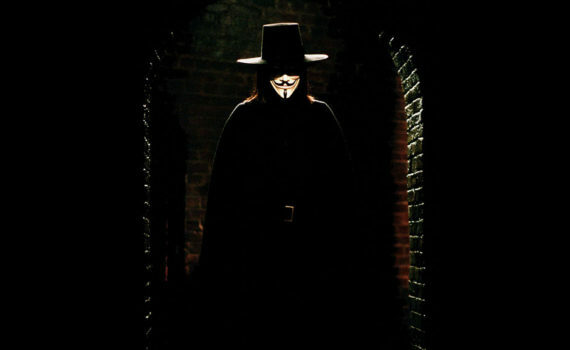 This masked man calls himself ‘V’, wears a Guy Fawkes mask, and vows to not only blow up Parliament, but to dismantle the entire system. Working with him, unwillingly at first, is the beautiful young Evey, a rebel at heart but someone who has given up hope of a better world, at least until now. The message this movie sends is terrifying, made all the more scary by recent events around the world; Brexit, Trump, etc. Closing the borders, doubling down on white nationalism, driving fear into the hearts of citizens until your protection is the only thing they can count on; it’s a recipe for disaster, or at least the complete annihilation of freedom as we know it. In a complex world, there is a balance between safety and humanity, one we are constantly trying to find, but we can do it without a dictator. On that level, with that message, this film has a lot to say and should be heard. Then there’s the comic book element, the larger-than-life hero, the knife fights, the bombs; all of that is very cool. But what undermines all the positives is Portman, who I thought couldn’t be worse in this role. Her accent, her demeanor, her lines; she was as believable as a high schooler pretending to be an English damsel. Shaving your head doesn’t instantly make you perfect for the part, and her performance really let me down, as I was expecting so much more. If acting isn’t the end all, be all to you, if you can get past that hiccup, then the rest of the film is strong enough to recommend.